There are days when you have to really love what you do. Last week was one of them. I was trying to head down to Southern California for the International Alpaca Odyssey show when a snow storm hit. Instead of getting in my car and driving down to the show, I found myself shoveling snow off the roof of my shelters, sitting in a cold dark house because of no power and watching as the weather turned from bad to worse. A tree limb came down taking out a power line and there was a live wire across my driveway and the limb took out some pasture fencing. The snow collapsed one roof of a shelter too. But despite all that, it was a great day because I have wonderful alpaca neighbors that came over as soon as they were dug out of their place and with good old duct tape and hay twine, we made a temporary shelter and the power company came by 5 pm and got my power all working again. The farm isn't quite put together yet but it was together enough that I could get away for the show. I came in drenched and frozen many times that day. I had to ask myself was I nuts for doing this? It wasn't the most fun day in the history of Hum Sweet Hum but I do have to say, I wouldn't have traded it for a day back at my desk job. The reality of alpaca farming can be tough but in the end, I wouldn't change any of it. Today, I was out pounding t-posts repairing and securing the pasture fencing that was damaged. It may not be pretty but the alpacas are happy again to be out grazing and I know the fence is once again secure for them to be safe. I got asked a lot when I finally made it to the show, if I was glad I made the move, and I can honestly say, I love my life and my farm even with the challenges. Look for a new blog about the happenings at the alpaca show! That was a fun weekend!!!! Rule #1: Click means treat. If you click, always offer a treat. Even if they don't accept it, you must offer it to keep the effectiveness of the click. If you mistakenly click at the wrong time, you still offer the treat. That is your mistake, not theirs. In clicker training, the reason it works is that the animal gets paid for doing a behavior you want from them. It is an especially powerful method for animals like the alpaca that are instinctively skittish. They aren't known for wanting to be near or engage much with humans but with clicker training, you can earn their trust and have fun doing so. Once I have an alpaca eating out of my hand, I can usually get them to do all sorts of behaviors. They can quickly learn to stick their noses into their halters with me simply holding it up in the air. While training a batch of weanlings, they so enjoy the halter game that two or three are sticking their noses through the halter at the same time! The reason the click works is that you have created the Pavlovian response that the noise means something tasty is about to happen. They will want that noise to repeat and figure out what they did that got the click to happen. I'm sometimes asked why a person has to keep giving treats. They want the animal to do the behavior because they told them to do it. My response is, "When you go to work, would you be ok not being paid?" Sometimes we do lots of jobs because we need a paycheck. Well we are asking our alpacas to do something that is really pretty huge. We are asking them to go against their instincts. So it seems pretty reasonable that we should be willing to pay or reward them for doing so. The "cost" to us is minimal considering the payoff. Whether you have a clicker, use your tongue or use no tool. 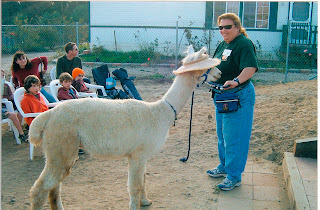 Reward your alpacas for good behaviors and you will be rewarded with animals easier to handle, more social, save time and energy and you get to have a lot of fun too. Clicker training can be used for more serious training like teaching alpacas to walk nicely on their halters but sometimes the alpacas and I just like to have some fun. Bringing something new out to their pasture stimulates their curiosity. I especially like to take new things out to my boys. Keeping their minds active helps dampen more negative behavior like fighting. They have something much more interesting to do and keeping their minds active reduces stress too. Their attention span is pretty short so it doesn't take a lot of time out of the day to go have some fun. In the picture above, I attached an extra large hula hoop to some PVC pipe. The more brave of the lads came right over to check out my new contraption. Others hung to the back and let the first guy make sure it was safe. I didn't insist on them going through the hoop right away but gave the brave ones a click for being curious. Knowing that click sound means treat, that immediately tells them that game time has begun. So now the challenge is to figure out how to get more clicks. So they try different things to hear the click and I lure them closer to the hoop with the treats so when they get close enough to where I want them, I click them again. A few times doing that, they start getting the idea of me wanting them to pay attention to the hoop. Then I ask a bit more of them and want them to stick their head through the hoop to get the click. They do that a few times and then ask for more. Some catch on pretty fast and go through the hoop pretty quickly but others I have to work more to lure them through. Once one gets it, the others tend to get braver too. Or sometimes the brave one is having so much fun, he starts to hog the fun to himself! After the game time is over, I sometimes leave the toys out to see what the boys will do. Is it ever cute to watch them go through the hoop on their own just for the pure fun of it. Alpacas are really smart animals. People often mistake their normal skittish behavior for lack of intelligence but I have found them extremely smart and catch on quickly. If you don't have time, find a kid. The alpacas love it and so will the kids. 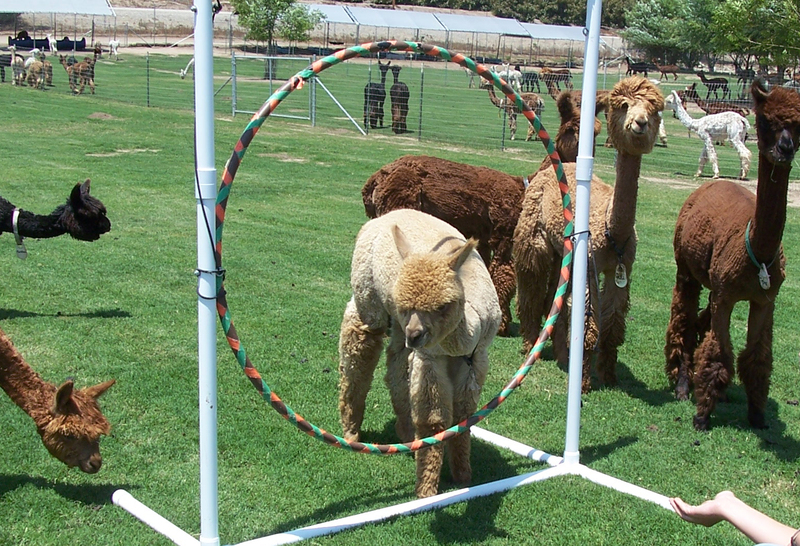 It's a great afterschool project to make hula hoops and train alpacas! Herd Any Good Ones Lately? Hanging out with my boys at Alpacas at Hum Sweet Hum is guaranteed to give me at least one good laugh a day. They are such characters. I like to do more socializing with my boys. I find that they love my clicker training games. It keeps them engaged and interested. Keeping them focused on something positive minimizes their fighting too. It seems that the negative fighting behavior increases when they are more bored. So if I can keep them busy with new activities regularly, I have minimal fighting in my pastures. The boys like new things so working with them to teach them a new trick is fun not only for me but for them. It also helps when it comes time to open farm days. Visitors are wowed when Mowgli takes a bow or Baloo gives kisses on command. Mowgli is the only one that has gotten into jumping through the Hoola-hoop thus far. Clicker training animals is such a cool technique. It's one of the few training techniques I have found where an animal actually "offers" behaviors to request what they want. Raking up their beans can be so very entertaining. I can be out there raking away and Mowgli or Baloo will come up and start taking a bow or giving me kisses to see if I have some treats in my pocket. And when I'm trying to teach them a new behavior, you can see them concentrating on figuring out what it is I'm asking of them. Nothing is more rewarding for me when that light goes on and they get it. You can see it in their face and eyes when they truly get the new trick or behavior. It's a real Aha moment. For a fun new thing, I took out my Easy button from Staples and thought it would be quite funny to see if they could depress the button and hear the canned voice say, "That was easy!" I was thinking it would take a number of days of working with my boys to get them to learn what I wanted them to do with this funky looking device. Much to my surprise, it took them about three clicks and they got it. Did I have to chuckle when I realized that it was a true statement, "That was easy!"